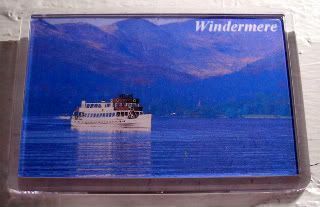 My sister brought this back for me - it's the cruise boat that she took at Windermere Lake, in the ever-so-romantic Lake District. At something like 10.5 miles long and up to 200 feet deep, it's the largest lake in all of England, and is even classified as a public highway. I chose it for today's magnet, because of the ferry. Up to now, ferries have gotten somewhat of a bad rap. They capsize, they run aground, they run into things - or, in George Clooney's case in One Fine Day, they leave kids behind. But yesterday at work, we all gathered around the tvs to watch the "Miracle on the Hudson" downed plane coverage. We listened as Wolf interviewed person after person, and watched as the plane was escorted by its entourage of helpboats. And, we got to see NY Waterways and Circle Line ferries help out in whatever ways they could. You know what? For some reason out, of all the footage they showed, I loved seeing both of those two ferry lines helping in whatever way they could. It was truly a happy-making feeling for me. That, and of course, the fact that everyone made it out alive, and that the pilot is a freakin' hero right now. September 11, 2001. I was running around the office wondering if our 10am client meeting would still happen, until our chairman sat me down and said, joy, i promise you, the meeting's canceled. And then we all gathered to watch the horrifying coverage, first in our CEO's office, and then in our 2nd floor conference room with the rest of the company. The Blackout. While half of the darkened eastern seaboard was out getting hammered, a group of us spent the night at the office, after an afternoon spent playing games in the corner office. I've never had so much fun in the office...though people say it was because I actually had company in the office that night. Hello! Sleepover! Y2K. Well, not the NYE, but really, we all had to muddle through those last crazy contingency planning months of 99, didn't we. The Hanging Chad. Again. Really? That Yankees guy who flew into the NYC office building. Well, ok. That wasn't really at work, but you get my point. And there are so many other events that I always remember where I was. In the office. With the same group of colleagues. Always. But, I do think there's some truth to the matter that you really do share a lot of your day with coworkers, in the office. I guess it's only natural that we'd bond over the tragedies and triumphs of the day. Next up? We're all totally meeting up next week in the 2nd floor conference room for the Obama inauguration. The Windermere boats also take you across the way to Beatrix Potter's house. I didn't do that though. Oh well. Lord. It runs in the family. You were thisclose to Beatrix's house and you didn't go? C'mon. You can't spell magnetism without TIMES, as in the TIMES of your life and you've had some incredibly memorable times in the office. We are lucky to have a great group of colleague Joy, and you are at the top of that list! Thanks. The feeling's mutual, for both you and anon. i want to know who anon is... and! maybe s/he should change from anonymous to the Stig. just saying. also... that's my favorite line from One Fine Day! I got kids!